Whew! I really struggled trying to write this post. It seems that all of my creativity has disappeared. The food this week was delicious, comforting, and challenging. My co-chef was attractive and entertaining. And yet – my brain is only stringing together boring sentences. For your sake, I’ll try to make this fast. Our Taste the World experiment took us to Albania this week. We actually spent several days on this country because we made two meals instead of one. The first meal consisted of Tav Ma Presh (a leek casserole), which we ate with smashed new potatoes and a common Albanian tomato and cucumber salad. The second meal required the majority of an afternoon to prepare because we just had to make Flija – a traditional dish with it’s own celebratory day! Tav Ma Presh is primarily made of leeks, along with some red peppers and minced lamb, beef, or chicken. 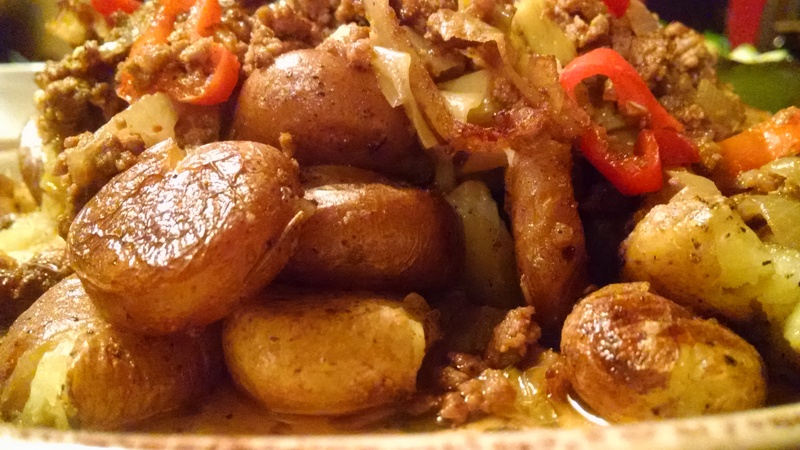 It’s a hearty comfort food that reminds me of Shepherds Pie without the mashed potatoes. A lot of the recipes we looked at actually suggested serving it with mashed potatoes or just as a side dish for another meal. 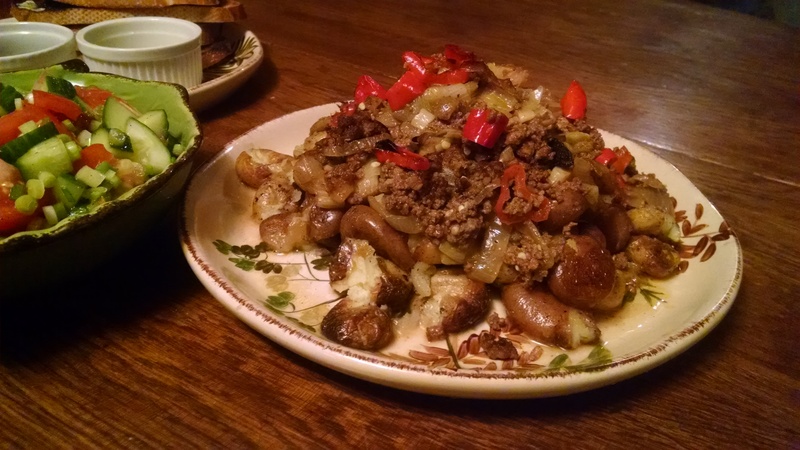 We tweaked the traditional recipe to utilize what we had on hand (ground beef and baby potatoes), and we both loved the result! We also wanted a tiny bit of spice so we added a few red jalapeños to our dish. You’ll find our recipe for this and the other dishes below. 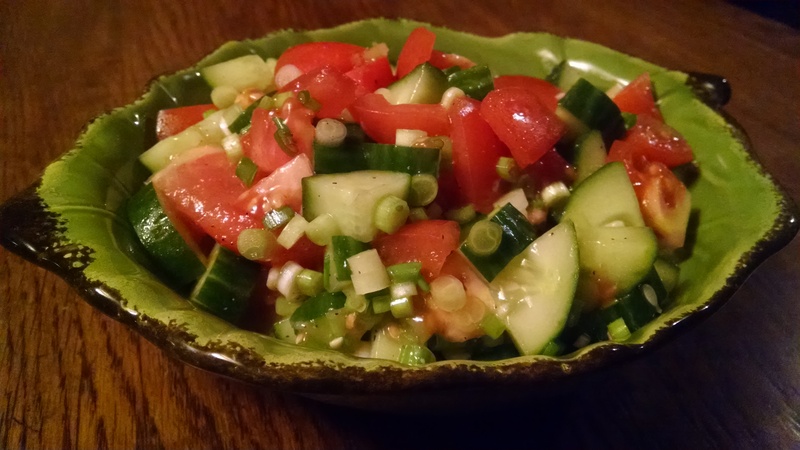 The cucumber and tomato salad was pretty basic but the addition of green onions and lemon juice made it a refreshing contrast against the rich and fatty Tav Ma Presh. Our attempt at making Flija was not entirely successful, but it was an interesting challenge nonetheless. March 18th in Albania is Flija Day and families invite their friends and relatives over for the day to prepare and eat Flija! A whole day for one dish? 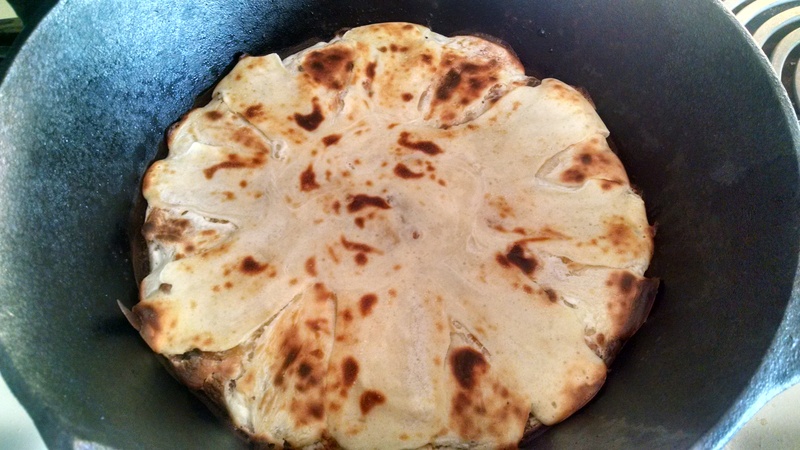 Flija takes at least three hours to prepare. Flija is a many layered “cake” made with a simple pancake-like batter that is baked in layers and brushed with a thin, creamy, yogurt batter. The finished dish can be eaten with either savory or sweet toppings. Flija is traditionally made outside, near an open fire. A large metal lid called a sac is placed over the fire and hot coals are piled on top to maintain the temperature. The sac is used to bake each layer of the Flija as it sits near the fire. The process is kind of difficult to explain clearly – I recommend watch one of the following videos to see how it is made traditionally. To make our Flija, we had to improvise. 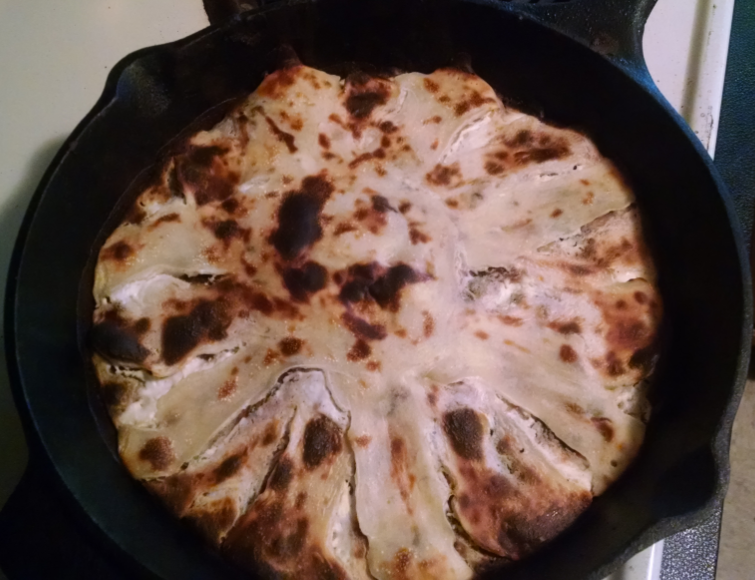 We used my deep cast iron pan and baked each layer under the broiler in my oven. Mistakes #1 and #2. We also played with the recipe a little bit and combined several recipes that we found. Mistake #3. 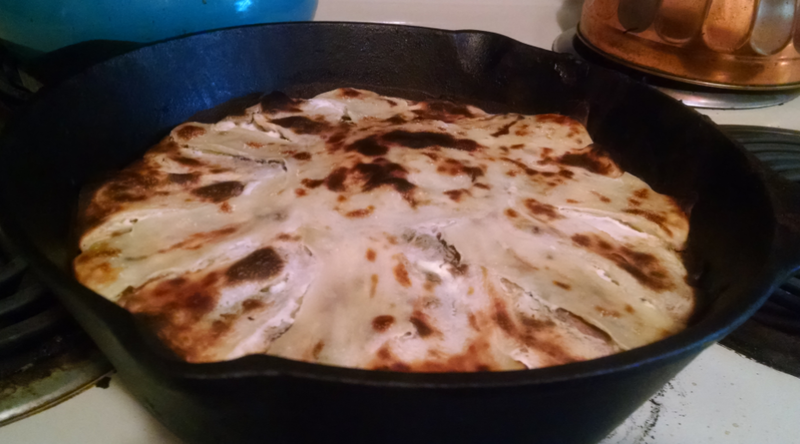 None of the recipes specified whether or not the pan should be preheated – so I preheated. Mistake #4. 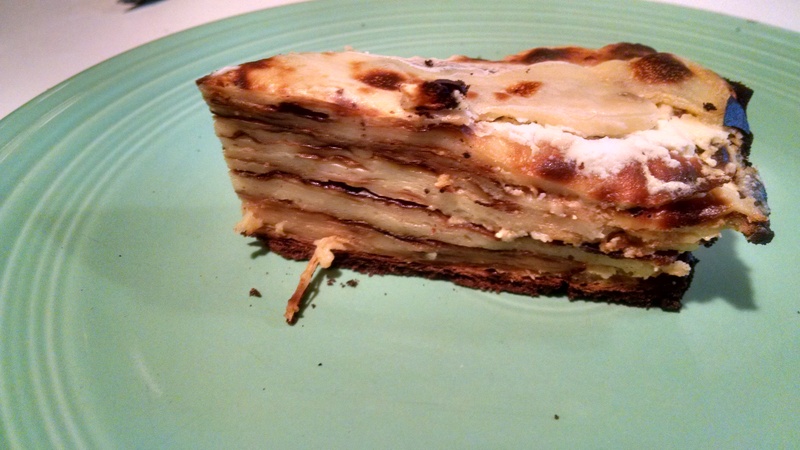 The bottom layers of our dish were burnt and crispy – a result of preheating and (I think) using cast iron. All of the edges were over cooked and each layer was denser and chewier than I think they were supposed to be – a result of being in a hot oven for 3 hours and the recipe we used. Still – we were able to taste the potential in the edible parts of our dish. We’ll be keeping an eye out for a suitable pan and lid to attempt this dish again the traditional way. I’ve included our recipe below because I’m not entirely convinced the recipe was the problem. I’ve also included a few links to a few basic recipes in case you suddenly have an afternoon free and the desire to stand next to a fire or oven for most of the day! Heat 2 tablespoons olive oil in a deep frying pan over medium high heat and sauté leeks until soft. Place leeks in a baking dish. Heat the remaining tablespoon of oil in the frying pan and cook the onions and the ground beef. Add the tomato sauce, red peppers, salt and pepper to taste and enough beef stock to cover everything. Bring to a boil. Pour the meat mixture over the leeks and bake for 1 hour at 375. Serve as a side dish or with choice of potatoes. Lay potatoes on an oven safe pan and drizzle with olive oil. Stir to coat evenly. Remove from oven and smash each potato with a fork. Pile potatoes on a platter and serve. Taste and adjust lemon juice and seasoning as needed. Using a squeeze bottle or a spoon, spread a thin layer of batter #1 on the bottom of the pan as a base. 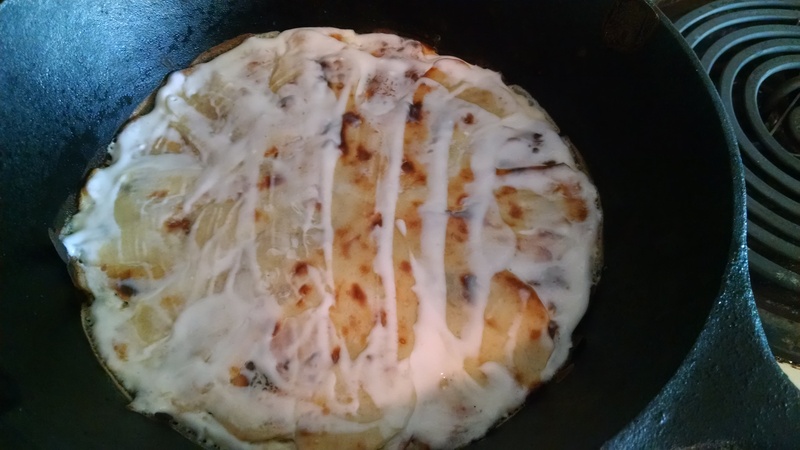 Place pan under broiler until batter is cooked and starting to brown in spots. Remove from oven and spread a thin layer of batter #2 as the second layer. 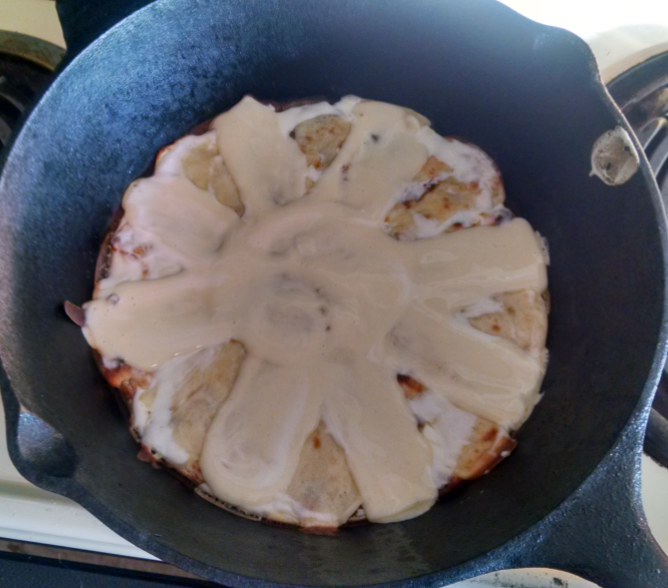 In a “star” pattern, add a layer of batter #1. Repeat these two layers, alternating the star pattern so that the “cake” slowly grows evenly, until pan is full or batter runs out. Serve with jam, cheese, spicy vegetables, or other choice of topping. 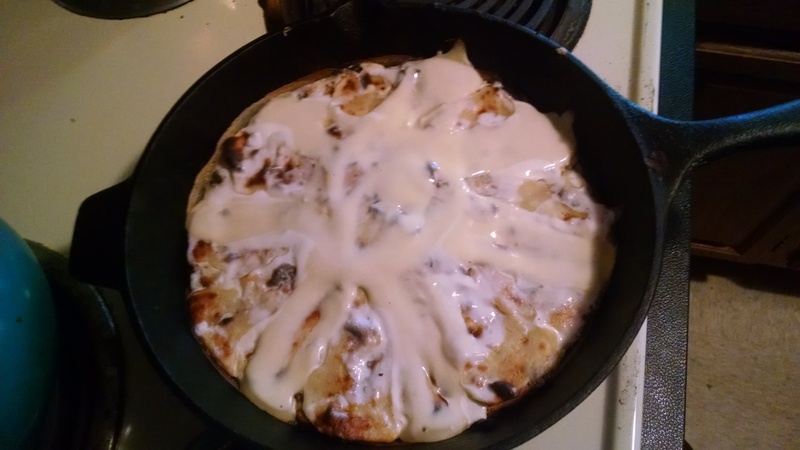 I’ve included a few “in progress” photos to help illustrate the recipe. Have you been to Albania? What was your favorite dish? Thanks Terri! The Tav Ma Presh was especially good.